Vera and John Casino has just added the brand new online slot release from ELK Studios titled Poltava – Flames of War, set in a past war theme setting the reels are filled with Cavalry, Artillery, Riflemen which are heavily stacked on all of the reels and some interesting mechanics revolving around these symbols and of course the more regular lower paying regular symbols (10, J, Q, K, A). The Poltava slot uses a 5×4 reel set and has 40 active paylines, as with all ELK slots there is a variety of betting options included in all their releases, these include a variety of additional automatic betting strategies such as Optimizer, Leveller, Booster, and Jumper, for the most part however, we prefer to play using standard settings and vary the bet size when we decide to alter it. 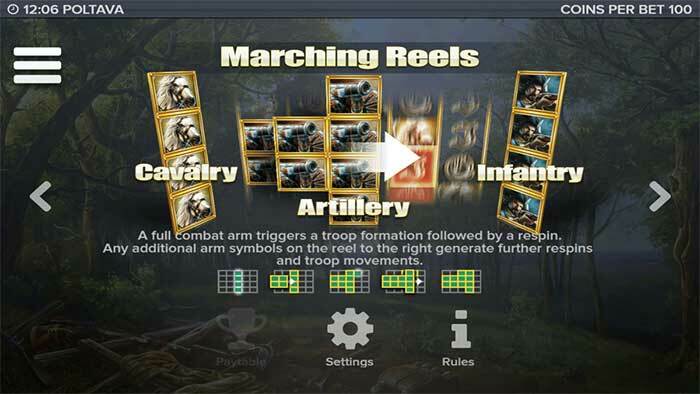 There are 2 main features to be looking out for whilst playing, the first is the Marching Reels feature which is triggered during base game play when a full reel of matching high paying symbols lands on a reel, additional symbols are added to the reels to form a troop formation and the reels respin, any additional symbols landing to the right will of this formation will trigger further respins. The main free spins bonus round is triggered by landing 3 of the Lion scatter symbols on reels 2,3,4, these symbols will then also act as Wild Symbols in the main Flames of War Free Spin round. 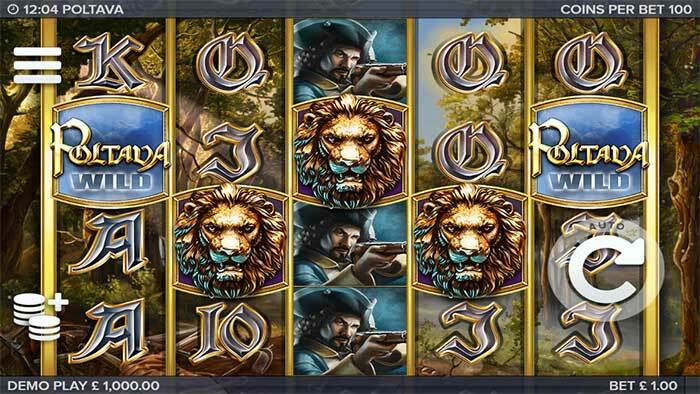 The bonus round is triggered by landing 3 of the Lion Scatters on reels 2,3 and 4, this then triggers the Flames of War Free Spins. The positions of these triggering symbols are then held in place and transformed into Sticky Wilds, the player is granted just an initial 3 Free Spins. During the free spins if any additional Wild symbols land on the reels then a further free spin is awarded as well this new wild symbol being held in place for the remainder of the bonus round. During the free spins round a different reel-set is used as it’s possible to get these extra wild symbols on all of the reels, which can quickly turn this bonus round into a very exciting affair, with additional spins being granted and more Sticky Wild being held on the reels. The Poltava slot has an RTP (Return to Player) of 96.4% ensuring you should have some decent playtime provided you bet a sensible stake. Another solid slot release for ELK Studios, we have to admit we skipped over the release of the Bloopers slot, and this has become a somewhat guilty pleasure slot for us. 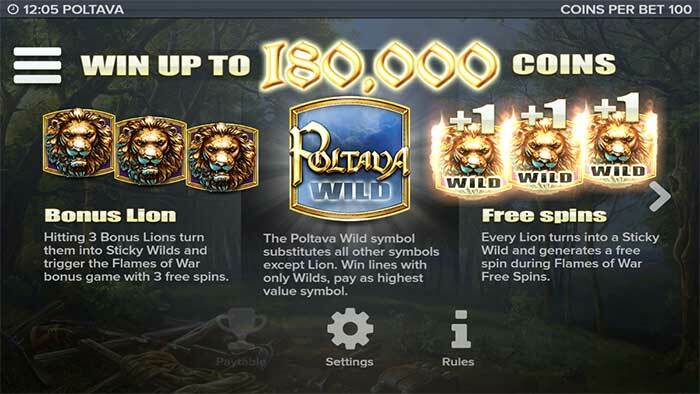 Poltava is definitely worth a try, we had regular bonus rounds in our testing and although we had no massive wins (Mainly in the 30x – 50x Stake wins), there is definitely some win potential with the sticky wild mechanic and heavily stacked symbols and Marching Reels feature in the base game.